This is a sweet story that reunifies a young woman with the grandmother she has estranged herself from. We discover the reason for their separation as the story progresses, and it is sad that Alyssa turned away from her family instead of leaning on them for support. The writing style has a chick-lit feel as it describes the feelings of the main character and her interactions with her best girlfriend and others. 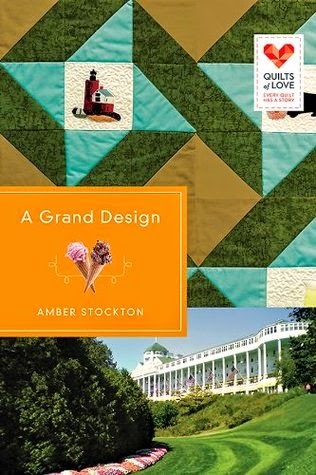 I was compelled to skip over several paragraphs in the beginning of the book describing Mackinac Island as if it were a travel promotion- I would have rather learned about it gradually as Alyssa visited the location. Her love interest Scott was adorable and sweet, just what her character needed since she definitely had issues with men. Sometimes the dialogue was stilted when the author gave them unusually descriptive words that aren't normally used in casual conversation. The quilt block collection quest introduced several wise mentors for Alyssa who imparted loving words of advice. I'm currently reading this book so I'll post my review soon... in the meantime, check out the great giveaway and join the facebook party event!